Jeaneane Fowler was formerly Head of Philosophy and Religious Studies at the University of Wales, Newport, and later an Honorary Research Fellow. Her publications include Hinduism: Beliefs and Practices (Choice Outstanding title, 1997); Humanism; World Religions: An introduction for students (editor); and Perspectives of Reality – An introduction to the philosophy of Hinduism. Shifu Keith Ewers is a highly qualified Master of T’ai Chi Ch’uan, Pakua-chang and Fungshou Kung Fu, as well as being an established Tui-na Bodywork practitioner, and an Acupressure practitioner. He teaches and practises throughout Europe. He is President of the Lee Family Internal Arts Association and is Technical Director for the Bubbling Springs Association. This book combines academic expertise and philosophical inquiry with the practical expression of T’ai Chi. The authors combine eastern philosophy and the wisdom of T’ai Chi as expressed through a Master. The result is a harmonious blend of Taoist philosophy and the everyday use of its principles through the Chinese art of T’ai Chi Ch’üan. The exploration of Taoism and T’ai Chi begins by examining their origins and affiliations under the title of Beginnings. 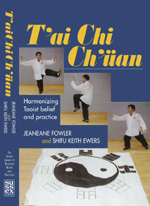 Subsequent chapters take up the themes of Harmony (expressing the duality and interrelation of yin and yang); The Way (which looks at the philosophy of the Tao and the path that leads to its practical expression through T’ai Chi); Change (which examines the influence of the I Ching and the Eight Energies); Direction (an analysis of the Five Elements); and Energy (which explores alchemy and the vital energy of ch’i). The primary focus is on Movement and Stillness, which harmonizes the softness of movement with the stillness of the inner self – leading to the theme of Unity, the ultimate goal of philosophical Taoism and the practical dimensions of that philosophy in T’ai Chi.